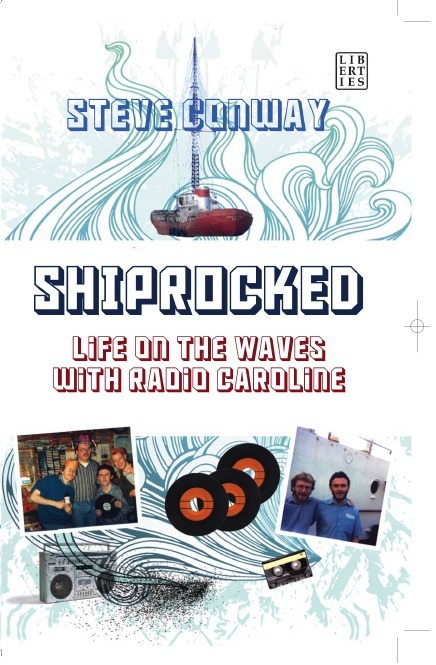 After a series of public readings from Shiprocked – Life On The Waves with Radio Caroline at venues around Ireland I’m pleased to be able to announce a pair of UK readings on March 27th and 28th. On Sunday 28th March, I’ll be reading at a special Seven Towers event at The Hammersmith Ram (time to be announced shortly), along with a number of other Irish authors and poets. The Ram is a great, friendly pub, very accessible by public transport, just a couple of minutes walk from the tube and on many bus routes. More details here soon. The special event of the weekend though is my long wished for return to the town of Ramsgate, virtually on the doorstep of Radio Caroline during its days at sea, and embarkation point for many clandestine tender runs in the late 1980s. I’m coming to Ramsgate to fulfill a long-standing wish to return to the town and thank the brave team at the RNLI, whose Ramsgate Lifeboat came out to our assistance when the Ross Revenge ran aground on the nearby Goodwin Sands in November 1991. Since the publication of Shiprocked a year ago, I’ve done a number of fundraising readings for the RNLI in Dublin, Dun Laoghaire and Galway, but I’ve always wanted to go back to Ramsgate, and give a personal “thanks” to the actual lifeboat station which came out to our assistance on the darkest day of my life. Although we were eventually rescued by helicopter, the Ramsgate lifeboat crew braved incredible seas to come to our assistance, and came close to losing lives when their craft ran aground on the sands beside us, and a crewmember was washed overboard. As well as giving the profits of each book sold at the event directly to the RNLI, I look forward to reading the tale of what happened that morning to illustrate just how desperate things looked for us, and how glad we were to see them. Plus, there will be several of the lighter tales of life at sea with Radio Caroline too, and I’m hoping that many of the local people who remember Caroline from the 80s will come along to hear what it was all about. The event takes place at 3pm on Saturday 27th March at Ramsgate Public Library, which is close to the RNLI station in the town. Admission is free, but a donation to the RNLI will be appreciated. I was more than a little surprised this morning to follow the trail of a sudden influx of inbound traffic to this blog from christopherengland.com to discover this very flattering piece written by the man who I admire as one of the unsung titans of speech radio. While the facts of our friendship in the 90s are truthfully described, Chris paints a far more interesting picture of me than I recognise myself. I describe Chris as an unsung titan of speech radio, and this he is. Involved in pirate radio in London from the early 80s, and with a stint on Radio Caroline in 1989 (which is how we came to meet) Chris then went into speech radio with careers behind the scenes at TalkSport and elsewhere, as well as being involved in a host of satellite ventures not least of which was his own creation, Euronet, which failed only because it was 10 years ahead of its time. His career in the media bsiness continues to this day, though I have to shamefacedly admit that I’m not sure exactly what he is doing these days, other than that it has relocated him to Liverpool. The thing that drew me to Chris, apart from our occasional business connections, was his sense of humour. At a time when everyone involved seemed to regard the pirate radio business with a very ernest seriousness, Chris was not above poking fun at anything or anyone, and he was a breath of fresh air in the gloomy 90s, if sometimes a little infuriating. Although rarely heard behind the microphone, Chris is a genius at speech radio, and I still remember his series of monologues and phone windups from the Euronet days, to which he brought wry humour and formidable intelligence, rather than the slapstick more commonly heard on radio. His piece about “wasps on buses” remains my all time favourite – phoning the enquiry office of the then London Transport to enquire about the man who puts the wasps on buses (because there is always a wasp on every bus in the summer – they are so well distributed it cannot possibly be by chance). Chris blogs regularly at christopherengland.com and his updates make though-provoking, if not always comfortable reading. I still think though, that he’s a talk radio hit just waiting to happen.